Responsibilities and Duties Job Description: Attending to customer queries through emails and phones calls. Designing & Preparing Itineraries & Domestic Holiday packages for customers. Handling Bookings & Documentation Processing Bookings by coordinating with operations Team Skills Required Good Communication written and verbal Indian Destinations Knowledge would be an advantage. IATA qualified/any other relevant Travel and Tourism qualification would also be an advantage Salary for this job :-Rs 13000 To 17000 par month. Note-Please apply with latest photograph & attach CV. 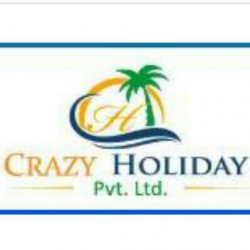 CRAZY HOLIDAY, One Of The Fast Growing Companies In Travel & Tourism, Is Providing Home Based Business Opportunity. We Need Committed & Result-Oriented People Who Can Join Hands With Us & Contribute In The Promotion & Success Of Our Business. Earn Huge Benefits In Form Of Income (Weekly/Monthly), Freebies & An Excellent Opportunity To Build Your Own Network & Visibility In The Tourism Sector. Come & Work In A No Target, No Selling, No Work Pressure, No Time Boundation & No Boss Environment. Kindly Provide Your Email Id While Replying. Thank You! Dear Candidates, We Are Looking For: Part-Time And Full-Time Customer Support Individuals To Help Us In Building Good Service Relationship &amp; Provide Better Services To Them. We Need Friendly Male/Female Candidates Who Have Basic Information of Computer, Passionate &amp; Willing To Be Successful With Us and earn Attractive Weekly/Monthly Perks and Rewards For Outstanding Performance Achiever. You May Continue With Your Regular Job &amp; Still Work With Us. No Targets, No Work Pressure. You’re Efforts &amp; Your Income! Work for any one, work at your leisure.., fresher, housewives, students. We are in immediate need of Travel Counsellors with burning passion for tourism, and committed to grow in career along with the company. Additionally, you should be confident, comfortable, and convicing during telephone conversations with guests. Communication skill in English, both written and spoken is vital, and fluency in Hindi and Kannada is necessary. Ability to work on computer with Microsoft Office programmes (Excel, Word, etc.) and internet are essential. We are looking for cadidates with one or two years of experience, but candidates with dynamism, energy, and passion are also invited to apply. Please send your most current and complete resume with your coloured photograph to travel.query@thevioletgrace.ventures now. Collecting the data information from crowd to create a database. Young talented male/females required with good communication skills. Computer knowledge (basic), Qul: +2, BE, ITI, ANY DEGREE. Dear Reader, We, at United Capital Club (UCC), are looking for individuals who can promote our business (only on internet) in travel & tourism (part time/full time) & provide customer service to people across India. UCC is an ISO certified entity listed on Ministry of Corporate Affairs. Our company provides best-in-class service in the Travel & Tourism sector across world. Besides this, UCC envisions providing income opportunity to those people who are passionate to fulfill their dreams. We are offering: 1. Day shift/No Targets/No Calling/No Product Selling. 2. Work from home & earn huge weekly income (up to 10,000) This position is open for people in service/business/college. Even retired/housewives/fresher can join us. Kindly call us nOw. LOOKING FOR CANDIDATE (MALE/ FEMALE) WHO CAN TAKE CARE OF HOLIDAY PACKAGES, DOMESTIC & INTERNATIONAL TICKETING. SHOULD BE EXPERIENCED, DEDICATED AND SELF STARTED PERSON. Aptech aviation and hospitality academy offers training for ground staff and cabin crew and after completion of the training we offer direct placement. Looking for potential candidates interested in working as cabin crew preferably female and should know basic English. If interested, send resume on deepika.cabincrew@gmail.com with a full size picture of self and your age, height and weight. Thanks. We, at THE FLAMINGO GROUP, are looking for individuals who can promote our business (only on internet) in travel & tourism (part time/full time) & provide customer service to people across India. Our company provides best-in-class service in the Travel & Tourism sector across world. Besides this TFG envisions providing income opportunity to those people who are passionate to fulfill their dreams. We are offering: Day shift/No Targets/No Calling/No Product Selling. Work from home & earn huge weekly income (up to 10,000) This position is open for people in service/business/college. Even retired/housewives/fresher can join us. Kindly call us now.